Red meat and Trump: Vermonters celebrate inauguration in D.C.
On Thursday evening, Jan. 19, in the back room of a dimly lit steakhouse near the White House, roughly 20 Donald Trump supporters from Vermont gathered to celebrate November’s Republican victory: the menu was red meat and wine. The gathered group included Rutland Republican Wendy Wilton, the city treasurer and a former state senator, as well as Joy Limoge of Williston, who ran for and lost a Chittenden County House seat last year. Darcie Johnston, who ran Trump’s Vermont campaign and is expected to snag a Cabinet job in the Agency of Health and Human Services, was also at the table, sipping on a gin and tonic. Johnston has been working 12-hour days on Trump’s inaugural committee, coordinating everything from marching band buses to credentials for preachers. Her voice was hoarse Thursday night, but she didn’t care. Trump won Vermont’s Republican primary last March, but lost the Green Mountain State in the general election to Democrat Hillary Clinton, 58 to 30 percent. With Trump in the White House, the Vermont supporters were hopeful Trump would tackle issues of concern back home, from the heroin epidemic to the lack of high paying jobs in rural areas. Speaking hours ahead of the inauguration, the diners agreed that Trump’s first priority, however, should be healing the country’s deep political wounds. Milton Eaton, an 85-year-old Brattleboro resident who drove to D.C. on Wednesday, also said he hoped for a new era of bipartisan cooperation. He felt while Trump was looking to bridge the political divide, Democratic senators were acting unnecessarily divisive. As food and wine arrived, so did Democratic U.S. Rep. Peter Welch, Vermont’s sole representative in the House. Welch has been in the Democratic minority for years, and is used to working across the aisle. In his re-election bid last year, he ran virtually unopposed, even snagging the Republican nomination too. 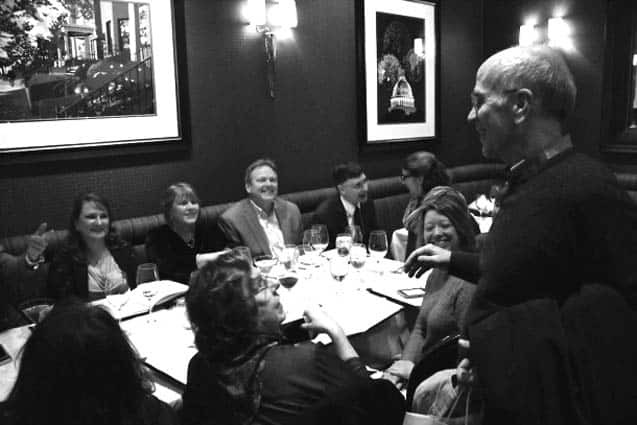 Welch’s office obtained inauguration tickets for the Vermont Republicans at the long table, and his visit to the steak house Thursday night was another bipartisan effort. “I’m excited you are here. I’m excited you support our democracy,” Welch said. “Trump lost big in Vermont, but a lot of good Vermonters voted for Trump,” he said. Welch spoke of areas where he could cooperate with Trump, and where he vigorously disagreed with the Republican president. A junior member of the House Oversight Oversight Committee, Welch has challenged his Republican chairman, Jason Chaffetz, to investigate Trump’s financial ties across the globe. “We had an oversight committee that was very aggressive towards President Obama, and candidate Clinton,” Welch said. U.S. Rep. Peter Welch, D-Vt., dropped in on Vermont Trump supporters gathered in D.C. on Thursday, Jan. 19. Rutland Regional Chamber of Commerce President Bill Ackerman and his wife Kasia Karazim can be seen at the far side of the table.